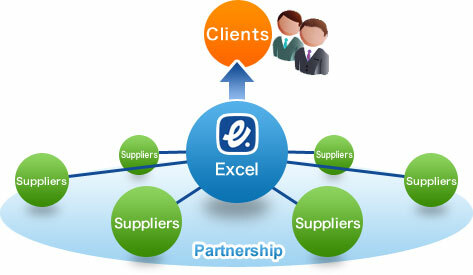 ﻿ Excel's Capabilities | Excel Co., Ltd.
At Excel, we do more than simply sell electronic devices. We offer our clients optimum solutions by linking up product planning and design, manufacturing and procurement activities. When clients face hurdles in product development and design, we work closely with them and our suppliers to provide technological support, helping them to develop customized solutions if required. We also handle device inventory management and ordering for our clients, provide EMS support for module (semi-finished products) manufacturing and offer a wide range of other solutions to them overcome the challenges they face. Excel has built a network of partnerships with a large number of electronic device makers, including some of the world’s top manufacturers. Through our tie-ups with Sharp, Alps Electric and other device makers, we have access to technologies and information that allow us to offer a wide choice of different solutions to our clients. Excel is actively expanding its overseas network to complement existing sites in Japan’s major cities. After opening our first overseas office in Singapore in 1993, we have created a global supply chain by establishing bases in important global manufacturing centers in Asia, such as Hong Kong, Taiwan and Shanghai. This network allows us to provide rapid and dynamic support to our clients. Our goal is to supply clients with the electronic devices they want, when they want. Guided by this thinking, we use our international network to gather information and procure products that address the diverse needs of our clients.